Mario would totally get Princess Peach this envelope to store all of her cute little white gloves that Bowser kept eating when she was in his castle. Her reaction: "Yahoo! Peach is the winner!" Mario's reaction: "It's a-me, Mario! Obviously I would-a get you a JAM Paper & Envelope a-product!" Want to feel as special as Peach and be able to store items safely from your enemy? Or just want to put all of your business cards, quick notes, or birthday cards in a princess colored envelope? This is definitely your match. Maybe even a better one than Mario himself. This envelope is available with a button and string closure for the security needed to keep away anyone else's claws. At the same time, you will look at sweet as possible. Choose this envelope to feel like a princess! 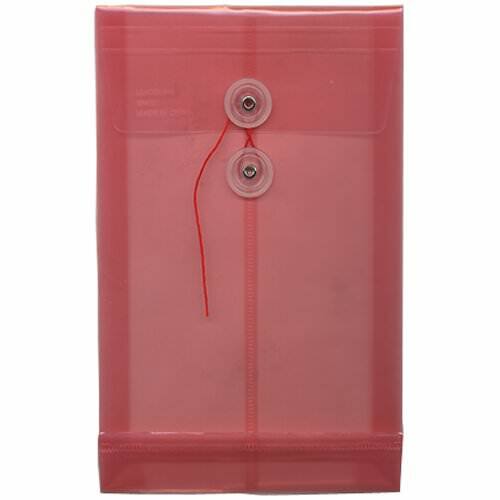 Pink 6 1/4 x 9 1/4 Poly Plastic String Tie Button & String Envelopes at JAM Paper & Envelope. Available in Pink, Magenta, & Fuchsia.